I love almost any good fancy cocktail, but cocktails ideal for entertaining are both fancy and incredibly simple. 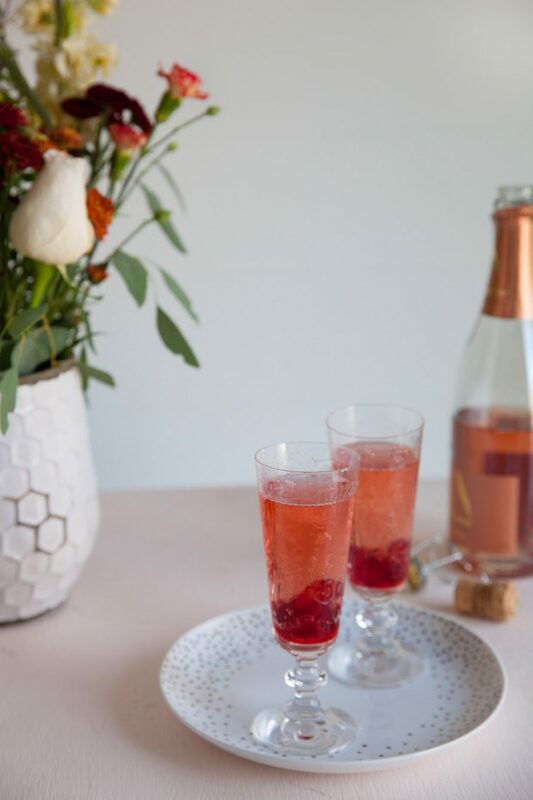 This vibrant red and blush hued cranberry rosé sparkler fits the bill in every way. It’s gorgeous, festive, and dead simple. At this busy time of year, anything that simplifies my life and makes me feel like I have it together is a hit in my book. 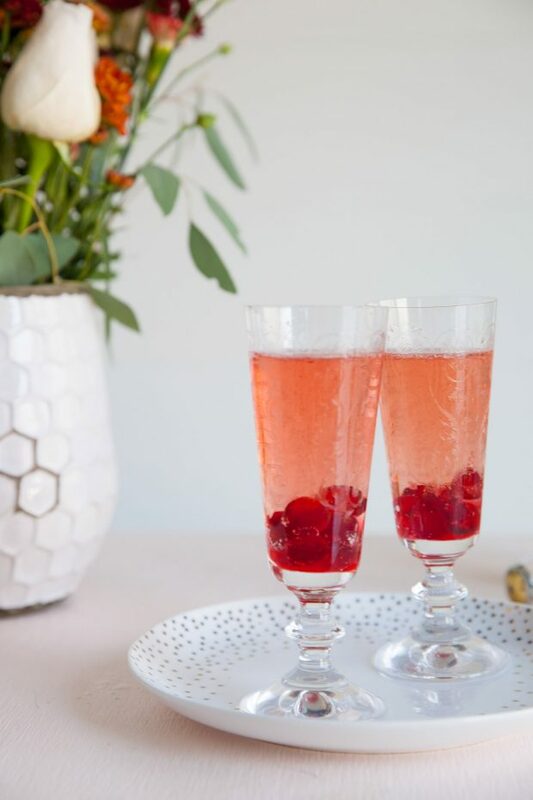 The beauty of this drink, other than its appearance, is that the cranberry syrup is made ahead of time and the “mixing”, if you even want to call it that, consists of adding a spoonful of syrup to a glass before pouring bubbles over the top. You can look like the hostest or host with the mostest when you pass these amongst your guests, but if you end up busy while mingling, guests can easily refill their own glass. Speaking of which, local friends of mine, I’ve got leftover cranberry syrup so come on over and lets pop some bottles and have a grand ol’ time! In a small saucepan, combine the sugar, water, and cranberries. Heat over medium-low heat, stirring occasionally. Keep an eye on the temperature as the mixture should at most come to a low simmer – you want to avoid boiling to keep the berries mostly intact. Continue heating the mixture until the sugar has fully dissolved into the water and the berries have popped just a bit, rendering the syrup a vibrant red color. Remove from the heat and let cool, then transfer to the refrigerator to chill before use. To serve, add a heaping tablespoon of the cranberry syrup with at least a few berries to a champagne glass. 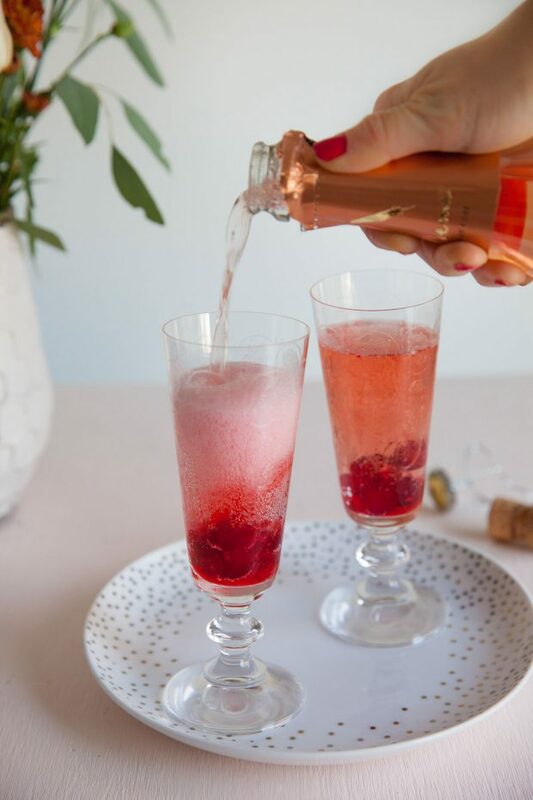 Pour the sparkling rosê over the top to fill the glass. Serve immediately.